This mousse has been my workhorse for years, used in dinners or lunches during the Christmas season. Each year the special embellishments change, so I can surprise those who have already tasted it. I’ve added persimmon sauce to this version which gives an unusual touch. 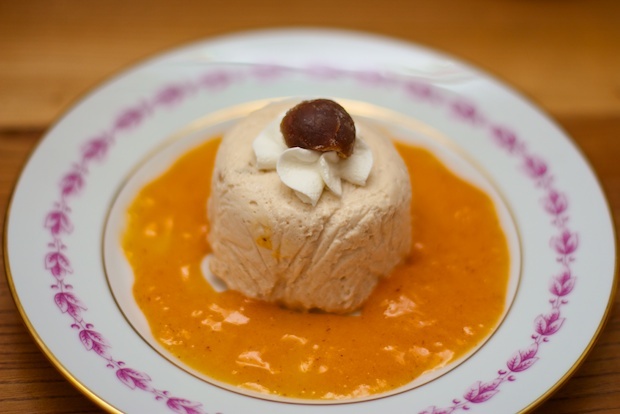 If persimmons are not one of your favorite fruits, you can serve this mousse with crushed meringues, meringue snow is very appropriate for the Christmas atmosphere. This mousse requires the use of two spirits. If you do not have them at home, you can buy two miniature bottles at a liquor store. The small bottles will suffice. For a successful result, you must have a good electrical whips or better yet, a multi-purpose tool like the a Kitcken Aid mixer. The cream and the egg must be whipped to perfection. The mousse can also be made two days before Christmas. Boil the milk. Turn off the burner as soon as the milk comes to a boil. Squeeze the sheets of gelatin and add them into the hot milk, stir to dissolve. Separate the yolks from the whites keeping the whites in a high-sided pan. Put the yolks in a bowl with raw sugar. Whip them to a foamy consistency and slowly add the hot milk. Turn the burner to low heat, the mixture should not boil, stirring constantly for 5 minutes. The cream should thicken slightly (you will see a veil if you spoon the mixture). 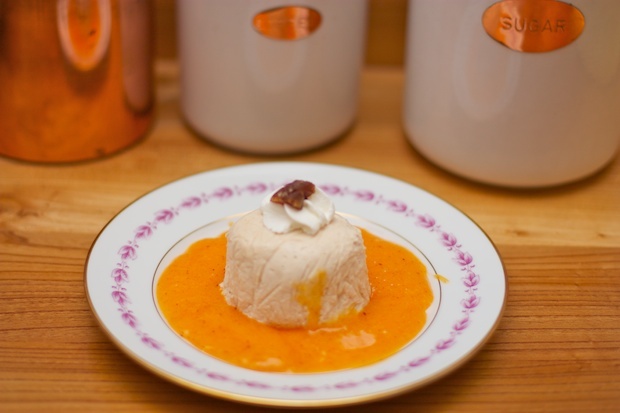 In a large bowl, add the chestnuts, marron glacé, crushed into small pieces, orange peels cut in small cubes, and the Cointreau. Pour this mixture over the cream and eggs and stir, allowing to cool. Whip the egg whites until they are firm and add a pinch of salt. Add them to the mixture, which now should be cooled, incorporating them gently from the bottom up. Whip the whipping cream with the vanilla extract. Add it with the same process of egg whites into the mixture. Pour the mixture into 12 individual molds or one large mold. Cover with foil. Put in the refrigerator to cool for 4 hours. Just before serving, prepare persimmon sauce. Peel the persimmons and whisk together sugar, cognac, and a few drops of lemon. Reverse the molds onto individual plates and decorate with the sauce.